Germany, at which they presented Sanya tourism products to German travel agents. 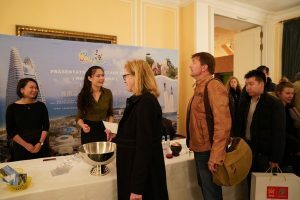 Representatives from the Frankfurt and Munich tourist offices, the delegation from Sanya, Hainan, China and more than 100 German tourism industry executives attended the two events, at which German journalist Hilke Maunder shared stories about her two sojourns in Sanya, one in 1988 and the other, thirty years later, in 2018. The collection of stories, entitled “Amazing Changes in 30 Years”, inspired German travel agents at the events to want to know more about the Sanya tourism market. At the events, Sanya showcased its tropical coastal scenery and the cultural charm of Li and Miao ethnic groups who reside in the area, telling the Sanya story through videos, a photo gallery and a PowerPoint presentation. CEO of TUI China Dr. Guido Brettschneider gave a presentation on Sanya’s tourism offerings designed especially for the German market and shared information about the area in general as well as the available tours. Ms Maunder talked about the changes that she observed between the two sojourns, showing several collections of photos she took when she traveled to Sanya in 1988 and 2018, among them, “Comparison of the Big Four Bay Areas, Then and Now”, “Small Fishing Boats Under Sanya Bridge Are Replaced by Luxury Yachts”, and “Atlantis Sanya Is One of the Only Two Atlantis Hotels in the World”. Zhu Weige, Consul and Head of Economic and Commercial Section of the Consulate General of People’s Republic of China in Frankfurt am Main, said in his speech that China and Germany have long-standing friendly exchanges and the cooperation in the tourism industry has enhanced mutual understanding and trust between the two peoples. Frankfurt’s and Sanya’s tourism markets have unlimited potential and a bright outlook. He looks forward to a broader and deeper cooperation in tourism between the two cities. 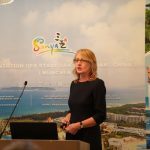 The Sanya Tourism Development Commission launched the joint promotions with TUI Group in a move to strengthen the communication and cooperation between Sanya and local travel agents, creating tourism packages suitable for German tourists, and making the offerings available to German travel agencies. German travel agents said that Sanya, with its tropical beaches and exotic appeal, is bound to interest German tourists. Sanya has been accelerating its expansion into the European market. In July of this year, a Sanya-London direct flight was launched, and Thomas Cook Sanya Branch, a joint-venture travel agency launched by Thomas Cook and the Chinese conglomerate Fosun International, was officially set up in Sanya on October 15th, 2018. Hainan, the province in which Sanya is located, is exploring how to best develop a pilot free trade zone with Chinese characteristics as well as a free trade port while Sanya is well into the process of transforming itself into an international tourism destination. The city will continue to speed up expansion into European markets through introductions to tourist agencies and other promotional campaigns.